Executive Order 13508, Chesapeake Bay Protection and Restoration, issued a call to action to harness public and private resources “to protect and restore the health, heritage, natural resources, and social and economic value of the Nation’s largest estuarine ecosystem.” Section 202(b) of the Executive Order directs the U.S. Department of Agriculture (USDA), in coordination with other federal, state, and local stakeholders to develop recommendations for targeting resources to better protect the Chesapeake Bay and its tributaries. An essential economic engine, the Bay watershed supports significant agricultural, forest, fishery, and tourism sectors. In 2004, the Chesapeake Bay Watershed Blue Ribbon Finance Panel observed that the economic value of the Bay may be over $1 trillion annually, but noted that the experiential and deep historical and cultural values of the Bay are beyond calculation. While agriculture and forestry remain the predominant land uses in the watershed – accounting for nearly 75 percent of the Chesapeake Bay Watershed – these lands are increasingly being converted to developed uses. Between 1982 and 2003, nearly 2 million acres of crop, pasture, and forest land were converted to large and small built up areas –an area greater than the entire state of Delaware. 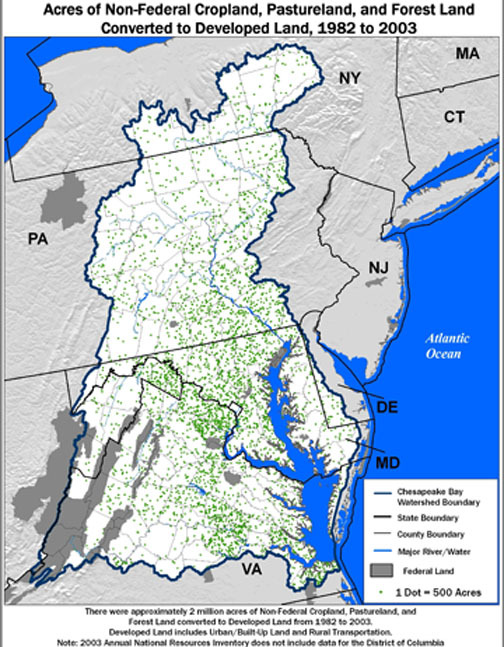 About 12 percent of the land in the Chesapeake Bay Watershed is now classified as developed, up from 8 percent in 1982. Approximately 130,000 new residents move to the Chesapeake Bay Watershed each year, driving a continuing market for housing and development. In addition to population growth, other pressures leading to agricultural land conversion include the economic viability of agriculture, complexity of doing business in the rural–urban interface, diminishing access to agricultural infrastructure, and increasing cost of regulatory compliance. As previously rural watersheds shift from agricultural to developed uses, the fabric of the community changes leading to further conversion of agricultural and forest areas. Agriculture covers about 25 percent of the watershed, representing the larges intensively managed land use. There are an estimated 87,000 farms covering about 8.5 million acres. While fertilizers, pesticides and manure and tilled soil are beneficial to crops, they become pollutants when water from irrigation and precipitation washes them into local waterways from unprotected fields. Substantial investment over the past several decades has helped to put conservation in place throughout the Chesapeake Bay Watershed. Through a partnership approach, Agriculture has achieved 50 percent of the goal for agriculture nitrogen, a 2 percent increase from 2007. About 49 percent of the goal for agricultural phosphorus control efforts have been met a 2 percent decline from previous years. Partners have achieved 48 percent of the goal for sediment pollution control efforts, the same as 2007. These estimates do not account for all of the best management practices installed voluntarily by private landowners with the use of public funds. An aggressive, voluntary partnership approach is called for, working with farmers, foresters, and other private land managers to continue to improve water quality while sustaining agriculture as a valued component of the Chesapeake Bay Watershed. This approach, while focused on water quality, must also include dimensions of increasing farm viability and rural wealth, strengthening access to local foods for well-nourished communities, and protecting the ecosystem benefits that make the Chesapeake Bay Watershed a national treasure. How should pollution from agricultural land be reduced? Join the discussion on Facebook. I am a retired research aquatic biologist that is active with issues concerning our environment. My basic view is that we need a healthy environment for our life sustaining air, water and soil (food). It has been brought to my attention that Pennsylvania is hard-topping about 350 acres per day. PA, with its 51 cities and 8,600 small towns and villages, currently is about 12% hard-topped. At 350 acres per day PA will have hard-topped a third of the state in 2035 or in 26 years. What are the long term implications for the quality and supply of the air, water and soil that people need in order to survive if this hard-topping continues?